Parent Education Resource Center (PERC): Elenco Electronics Inc.
We want to give a big THANK YOU to Elenco Electronics Inc. for donating 3 "Snap Circuits Kits" to PERC. At PERC we owned 1 "Snap Circuit", now we have 4! Let us put these "Snap Circuits" to good use, while making sure that we take care of them. Wouldn't it be nice if everyone had a chance to take home these fun and educational circuits? Below is a list, a short explanation, and a picture of each "Snap Circuits" that we own. If you would like more information on Snap Circuits, please visit Elenco's website. 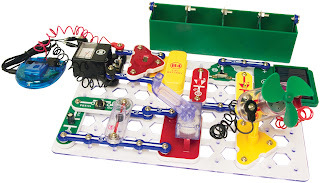 For whom these "Snap Circuits" ? For orphanage? I'm a freelance-writer for papernow.org website and a part of my money I give the orphans! So let's do it together!